Is Angola's Dos Santos really giving up power? Angolans are preparing to go to the polls to choose a new president. But although the country's long-serving leader is standing down, he and his family do not seem ready to give up power. 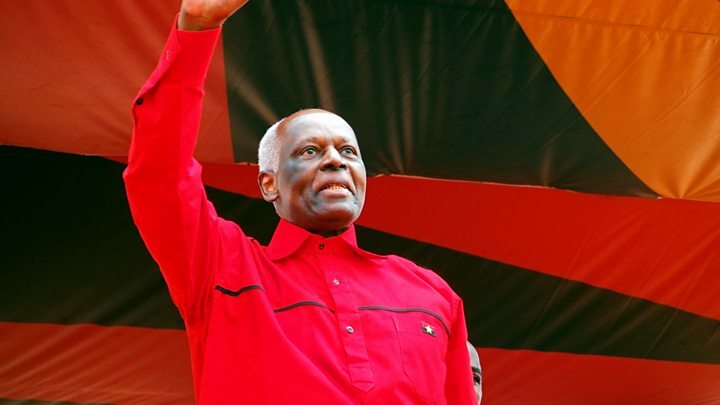 President Jose Eduardo dos Santos, 74, has been president of Angola since September 1979 - a total of 38 years. While the colours of his ruling party - red, yellow and black - dominate the streets of the capital, Luanda, there are sprinklings of the yellow and blue of opposition parties. Choosing his replacement marks a momentous occasion for a country where most people have known no other president. But with his children in prominent positions in Angola, and the incoming president's powers weakened, Mr Dos Santos is unlikely to be out of the picture. While many credit him for leading the country to recovery at the end of the war in 2002, others accuse him of staying in office too long. He is the world's second-longest serving president, behind Teodoro Obiang Nguema of Equatorial Guinea. He has also been dogged by rumours of ill health, after travelling to Spain for medical reasons and returning for a second time last month. Speculation got so intense that his daughter, Isabel, posted a statement on Instagram denying that he was dead. But it was before then, in February, that Mr Dos Santos indicated he would not run in the election and that Defence Minister Joao Lourenco would be the ruling party's presidential candidate. Mr Dos Santos will continue as leader of the MPLA, and the powers of the incoming president have already been weakened. Just a month before the election, Angola's parliament passed a law that prohibits the new president from sacking the heads of the army, police and intelligence services for eight years. Lawmakers also granted Mr Dos Santos a seat on the Council of the Republic which, Bloomberg reports, gives him immunity from prosecution. As one politics expert, Dalvan Costa, put it to the BBC, the president is "partially holding on to power". He points to former Prime Minister Marcolino Moco, who he says put it like this: "He's closing the doors but taking the keys." Mr Dos Santos's children continue to have a lot of power in the country - not least Isabel, who holds the title of Africa's richest woman, according to Forbes. She was already a billionaire with a broad business portfolio when her father put her put her in charge of the state oil company, Sonangol. As head of the company she is in a powerful position, given that Angola vies with Nigeria for top spot as Africa's largest oil producer. And Mr Dos Santos's son, Jose Filomeno, was chosen to head a sovereign wealth fund set up to invest Angola's oil wealth. While one daughter and son have influential positions in oil and finance, another son is in charge of entertainment. Jose Paulino, known by his stage name Coreon Du, is a singer and a TV soap opera producer. He reportedly said in 2013 that being the son of the president had been a hindrance to his career as people refused to play his music for political reasons. Another, younger, son of Mr Dos Santos, Eduane Danilo dos Santos, came under scrutiny in May in the Angolan press after he bought a watch at a charity auction for a reported 500,000 euros ($587,000; £456,000). The auctioneer was the US actor Will Smith, who was filmed saying he looks "way too young to have 500,000 euros". Danilo later apologised, insisting that the money was a donation to charity. These incidents add to the criticism that, as Mr Dos Santos stands down, he has failed to spread the proceeds from the oil boom. After appointing Isabel to run the state oil company, he was accused of nepotism by the anti-corruption body Transparency International. It ranked Angola 12th in its perceptions of corruption index. And the economy is one of the key election issues. Prices have risen sharply, and it's normal people feeling the pinch. A fruit seller tells me that what would buy me 10 oranges two years ago would now only buy seven. So while Luanda is classed as the world's most expensive city for so-called expats, there is still widespread poverty. This will leave many Angolans wondering if whoever succeeds Mr Dos Santos will do a better job of spreading the wealth more evenly. Why do Buhari, Dos Santos and Mugabe go to hospital abroad?